The Estuary Beat is controlled by the Dingwall & District Angling Club and extends for approximately 2.5 miles (4 km) from below the railway bridge at Conon Bridge down to the start of the Cromarty Firth. Like many estuaries, the best salmon fishing tends to be in summer/low water conditions and salmon tend to travel through the beat quickly when the water is high, so salmon & grilse catches tend to be modest in the spring, and peak between June and August. In the 2006 season, 103 salmon & grilse were caught on the club waters, but the catch return for 2007 was just 24 as high water prevailed for much of the season. The Estuary Beat is entirely tidal and is best fished in the hours either side of low tide, when access is much easier. The angling club have divided their water into 2 beats - a top and bottom beat - with the boundary being below the anchor pool. 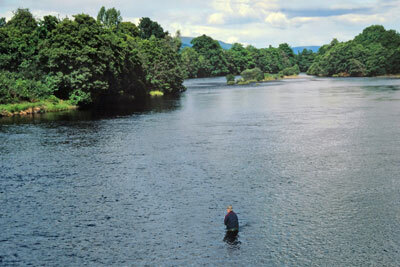 The top beat can be fished for salmon, grilse or sea trout with the pools immediately below Conon Bridge being the most productive. Fishing on the Bottom Beat is for sea trout and finnock only. 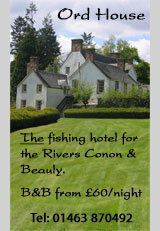 Because the fishings are tidal they benefit from sea trout and finnock being present from April through to September. 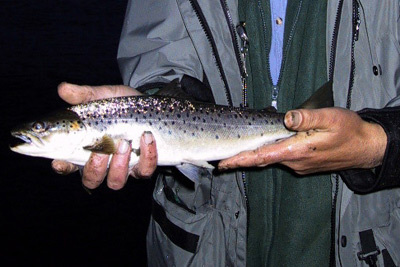 The angling club beat can still produce large numbers of sea trout, and as recently as 2002, 321 sea trout and 254 finnock were caught. These figures exclude finnock of 12" (30.5cm) or less. There are a number of risks associated with fishing the Bottom Beat as water levels can change very quickly due to both tides and the release of water from Hydro-Electric schemes upstream. It is strongly recommended that if you are not familar with this water that you look for a club member to show it to you and do not fish it alone. Please also be aware that the map above is indicative only and should not be used for navigating to the Bothy, Cairn and Tree pools. Access to these pools may only be safe for around an hour either side of low tide. Make sure that you are familiar with tide forecasts, both the times and forecast heights. Links to tidal predictions can be found on this site and tide timetables can be purchased from the Sports and Model Shop in Dingwall. Carry a mobile phone with you in a waterproof pouch. Never wade through deep water to get to shallower water. If the water level rises you may not be able to return.